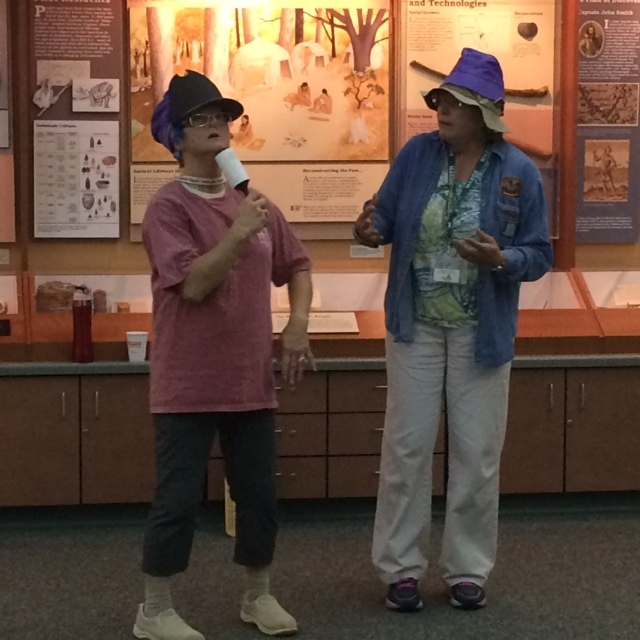 At last month’s ARMN chapter meeting, members Mary McLean and Melanie LaForce re-enacted the skit that won them the Golden Paddle at the February 2016 conference of the Maryland Association for Environmental and Outdoor Education. Here, Mary reports on the the premiere of “The Secret Lives of Migrating Blue-hatted Boobies.” Marion Jordan provided the photos of the June re-enactment. ARMN members Mary McLean and Melanie LaForce teamed up to win the Golden Paddle in the annual Challenge at the Maryland Association for Environmental and Outdoor Education (MAEOE) conference last February. MAEOE is a nonprofit organization that serves teachers, natural resource managers, nature center staff, and environmental program managers with dynamic training programs, workshops, conferences, awards programs, networking opportunities, and educational resources. The conference provides professional development opportunities that are relevant beyond Maryland’s borders, which is why Mary and Melanie attended. The skit began with empty-nester boobies Mary and Melanie playing “Go Fish” while waiting to migrate. The female spotted signs of fall (a handful of leaves thrown in the air). The male got ready by preening with a lint roller. They both fattened up with a handful of Tootsie Rolls and cotton balls thrown from the audience. Then they debated, “How do we migrate? How about a National Geographic video? ~Nah. Player broken. A Chesapeake Bay book map? ~Nope, won’t go far enough. Then the male had an idea (a plastic light bulb over the head). As they flew over the ocean, the male spotted a (tiny, green plastic) sea turtle far below.“There goes a flying fish!” (a bubble-blowing form), he observed, as it “flew” out into the audience. “We made it to Costa Rica!” the boobies shouted. The female sang and played her “maracas” (sponges) and the male yelled “Fore!” while swinging a toy golf club. 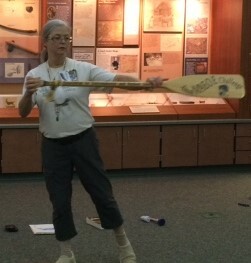 The skit was a clear favorite of the conference attendees and Mary and Melanie took home the Golden Paddle—a canoe paddle printed with each year’s winning team since 1997. The win also marked the first time that the paddle traveled from Maryland to the “other side of the (Potomac) river.” As Challenge winners, Mary and Melanie get to keep the paddle until next year’s conference when they will choose the format of the next MAEOE Challenge.